This massive expansion project required more than a quarter of a million square feet of new flooring. INSTALL Warranty Contractor Fromkin Brothers, Inc. of Edison, NJ, provided the necessary moisture mediation and then flooring installation. Approximately 30,000 yards of Nora Rubber Flooring was specified as the majority flooring product. But before the installation could begin, Fromkin Brothers had to address the issue of moisture. Moisture is the number one cause of flooring installation failure in the healthcare industry. It can also lead to issues such as mold and mildew which can be potentially life-threatening to patients with respiratory disease. The hospital specified that a complete moisture barrier be applied under the resilient flooring as a preventive measure. Because of its participation in INSTALL, Fromkin Brothers had access to manpower at a time of the year when it was not readily available and were able to invest the more than 27,000 man hours needed to complete the massive project. The design of the facility called for mostly curved walls and an unusual layout which proved to be difficult to work around and required a highly skilled labor team. The moisture mediation proved to take the largest effort of the project – abrading the surface, applying the moisture barrier and then applying the self-leveling compound. Each of these three stages had to be completed for all 250,000 square feet of the installation. The resilient flooring installation also presented challenges. The Nora product required heat welding which equated to literally miles of heat welding that had to be completed on a tight timetable. 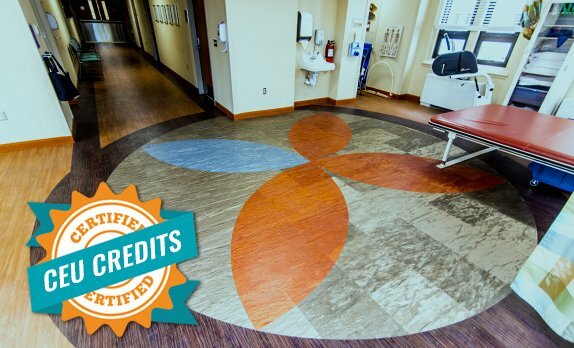 Despite the challenges facing the installation team, the flooring was completed on time and the expansion opened to treat its first patients in October 2014.